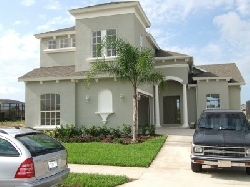 VILLAS AND APARTMENTS TO RENT IN CALABAY PARC AT TOWER LAKE, ORLANDO, FLORIDA. Welcome to our selection of holiday homes to rent in Calabay Parc at Tower Lake, Orlando, Florida. Calabay Parc at Tower Lake is a new gated community in Haines City with it's own clubhouse just fifteen minutes drive from Disney. Southern Dunes Golf & Country Club is close by with the internationally renowned Champions Gate golf courses just a few minutes away. Calabay Parc at Tower Lake is a few minutes drive away from various supermarkets including Walmart and a little further away the shoppers paradise of Posner Park. The clubhouse overlooking the lake incorporates a fitness centre, multi-purpose rooms and restroom facilities, Outside the clubhouse is a fishing pier, boat ramp, childrens' playground and a picnic area. Water sports can be enjoyed on the lake. Looking for self catering holiday accommodation in Calabay Parc at Tower Lake? Then below is a selection of apartments in Calabay Parc at Tower Lake, condos and villas in Calabay Parc at Tower Lake that can be rented direct from their owners. You can either click on each listing for further details or you can use our search engine on the left if you are looking for something in particular.